Remodelers Council members and guests are invited to the first dinner meeting of the year on Tuesday, Feb. 26 at Seawell's. We'll start with cocktails and networking at 5:30 p.m. then dinner at 6:00 p.m.
Our topic this month is the Certified Universal Living program. We've made some changes to this locally developed guide to building and remodeling for accessibility and visitability that you should be aware of. Chairman Tim Kehoe will lead the talk. We'll also learn more about Able SC and their work in our state. 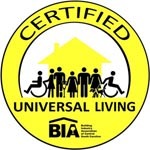 Free for Remodelers Council members and BIA Members in remodeling - please register in advance at BIAofCentralSC.com. $25 for guests with pre-registration.